I have my wish list of things that I would love to have for my home someday and a Fire Pit is on that list! Entertain all Spring and Summer long outdoors with an attractive Monterey Propane Fire Pit Table (ARV $350). This beauty offers 3 features in one--- an outdoor coffee table, cooker and fire pit for ambient lighting, heat and beautiful scenery. Want to learn more about this amazing product? Head over and check out the fully detailed review at Bella Savvy (http://www.bellasavvy.net/?p=53451). Dee received a sample at no charge in exchange for her honest review. The Monterey fire pit table base is made of a powder coated durable steel and the top is an attractive penny vein finish that matches the table lid. One lucky reader will receive this awesome product at the end of the giveaway. 1 Winner will be chosen at random at the end of the entry period 05/02/14. 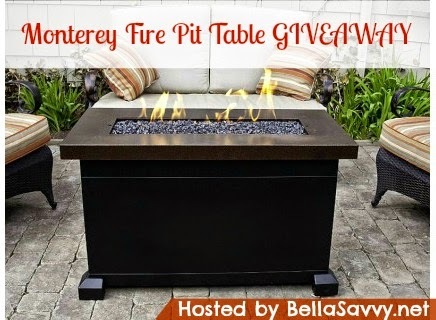 Prize is a Monterey Propane Fire Pit Table provided by OutdoorCooking.com (valued at $350). ~ Disclosure: Clair's Freebies is not responsible for prize shipment. Facebook, Twitter, & Pinterest are in no way associated with this giveaway. I like that it has a Matchless ignition with safety shutoff. I would love to have this for outside! I love sitting around a fire when it's dark outside. It is also a table. This is so perfect! I love that it can match with any decor...it's beautiful! Love the fact that it is a table and it is very nice looking. It is also attractive and not an eye sore!